This is perhaps the most common type of garage door. It is comparable to a typical door of a building that has hinges. It is opened or closed by swinging the door. The door may be divided into left and right sections to avoid requiring a lot of space when opening. This type of door is typically associated with commercial establishments. It is similar to the doors used by shops or stores in malls and markets. Featuring a space-saving mechanism, it is usually made of aluminum strips that roll up and down to open or close. A roll up garage door is ideal for garages with narrow driveways or those that immediately open into the street or public road. This type is only good for spacious garages and driveways. It involves a door that swings up and down. 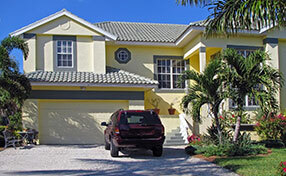 It is named as such because the door looks like a roof or an overhead structure when completely open. It forms a right angle in relation to the garage wall. As the term implies, sectional doors are doors that are divided into sections. The sections usually fold and stack against each other so the door can be opened. These sections may also be designed to slide against each other to open the door. This type of door involves a door panel that can be folded and slid to the sides to open. It may also be something that slides up and down. 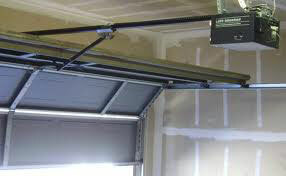 The garage door panel may be made to slide upwards into a frame connected to the ceiling. It's like an overhead door that slides up and down instead of swinging up and down. It is a space-saving door design.